Tradition to visit an interesting gig while I am travelling pays off all the time. When I have got to know about Leprous concert in Bergen, Norway, I knew it was the one worth a visit. 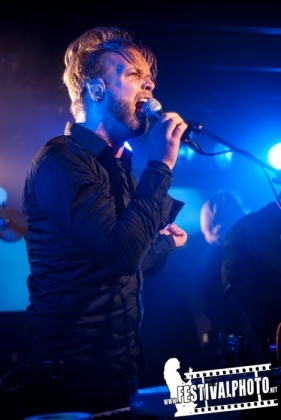 Leprous, Norwegian progressive metal band, was on their tour with Rendezvous Point to present their newest album “The Congregation”. On the 25th of September it happened at the Garage club in Bergen. Garage's bar was open as usual whole late afternoon and people for the Leprous gig started gathering already half an hour before the doors to the club were opened. Couple of beers before the gig, chat with the friends and around 10 pm everybody started slowly moving down to the cellar, where the stage was. In 40 minutes, the first band was on the stage. Another half an hour spent during the break between the bands and almost at midnight, Leprous was finally on the stage. Lights off, four screens with the visuals on and intro – everything that was needed to be done for attention catching entrance. Extremely warmly welcomed lads stepped on the stage and showed what they are made of – technical but very emotional music, energy and charisma. The band prepared and played 1,5 hour long set, mostly concentrated of newer songs because of the new album “The Congregation” presentation. It all sounded very well, the vocal part were noticeably in the front of many other. Despite that, all the instrumental parts were lovely, especially guitars and drummer's solo was noticed as well. The whole set was very continuous, with small gaps or none at all – music went on almost none stop and that was very pleasant for the listening and watching the show as well.